My friend brought me back a box of these when he returned from East Asia. These crunchies are wafer-like bites of joy. 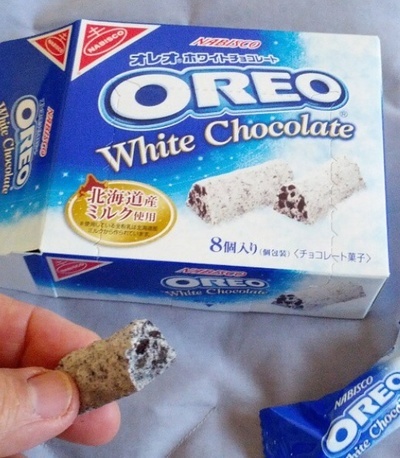 These bites resemble snow dusted logs because they're a mix of a cream-like oreo filling and chunks of the familiar oreo chocolate. They're a delicious and indulgent kind of biscuit, which are in a league of their own because I haven't encountered anything like them before and they're a completely new taste sensation. Reinvention always keeps me interested and Oreo have done a great job of reworking the classic biscuit. These are particularly good with a cup of tea.